For a low budget firewall functionality, a Cisco router with the proper IOS version can work as a network firewall providing stateful protocol inspection using the Context-Based Access Control (CBAC) feature. Many people use normal Access Control Lists on Cisco routers for traffic filtering and protection. However, a normal ACL is just a static packet filtering mechanism and nothing else. With a CBAC configuration, the router acts like a firewall. That is, it inspects protocols and sessions and keeps a state of the connection in memory. This means that an outbound packet (from inside the network to the outside) is inspected and a connection state of the session is kept in memory. The reply packet which belongs to the original outbound connection is allowed to pass through the router/firewall and reach the internal system which originated the connection. This stateful functionality is achieved by the IOS Firewall CBAC mechanism by opening temporary holes on an Access List in order to allow the reply packets. CUSeeMe Protocol, ftp, h323, http, rcmd, realaudio, rpc, smtp, sqlnet, streamworks, tcp, tftp, udp, vdolive. CBAC helps to protect also against DoS attacks such as SYN-floods or fragmentation attacks. CBAC is applied either inbound or outbound on a specific router interface. CBAC applied “Inbound” on an interface inspects traffic entering the interface and CBAC applied “Outbound” on an interface inspects traffic exiting the interface. CBAC cooperates with an ACL applied on the same interface in order to provide the firewall stateful functionality that we described above. Lets see a simple example below. Important Note: CBAC which inspects outbound traffic from an interface, will create temporary openings on the Access List which is applied Inbound on the interface. This is required to allow the return packets to pass through the ACL. Let us see a configuration example below to get a better picture. We have a border Cisco router connecting the internal LAN 192.168.1.0/24 to the Internet. We have a static public IP address 50.50.50.1 on interface Serial0/0. 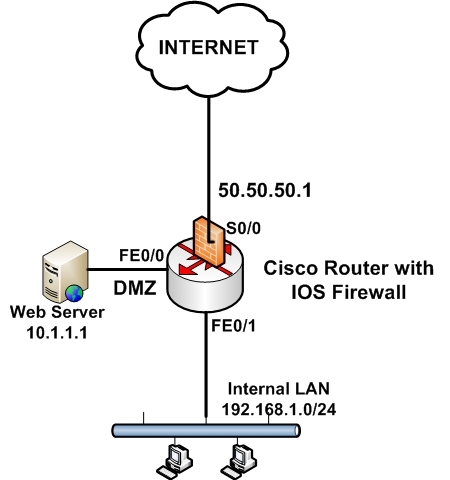 Also, we have a DMZ segment (interface FE0/0) hosting a DMZ Web Server 10.1.1.1. We want to allow access from Internet towards the Web Server only. We use static NAT to hide the Web server private address behind our public address. Also, we use PAT on interface S0/0 for all outbound communication from the internal LAN towards the internet. My only problem with this setup is that it provides no security between the DMZ and the internal LAN. In case the DMZ gets compromised the attacker can then easily access the LAN as well.